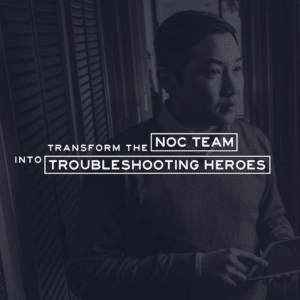 Transform the NOC Team into Troubleshooting Heroes! Long ago, when Heraclitus said, “Change is the only constant,” it definitely was not carrier networks that he had in mind. But today, one industry for which the quote perfectly fits is the telecommunications industry. Carrier networks are constantly undergoing change and NOC teams must handle the operational challenges that arise from numerous change scenarios — adopting and implementing new technologies, such as cloud, IoT, 5G, and more, planning and redesigning the existing network after mergers and acquisitions, managing new customers and their service requirements, handling new service requests, and of course, managing existing service offerings, such as MPLS, VoIP, Internet connectivity, mobile services, etc. The list goes on. At the same time, the carrier network must be agile enough to handle new service requirements as quickly as possible while ensuring that service quality remains high. There are several factors that help telecom service providers provide quality service to their customers but a key role is played by the service provider NOC team. It is the NOC team that manages most of the requirements and requests pertaining to the network – handling new service requests from customers, overseeing the change management process, proactively identifying potential service delivery issues and isolating the root cause of network issues and troubleshooting them before users begin to complain. Above all, the service provider NOC team must keep an eye out for potential SLA violations and customer dissatisfaction. This would be relatively easy if the root cause of every network issue was the performance of network elements or the lack of sufficient bandwidth. The NOC team could simply use its SNMP monitoring tool to find the problem device or link. But NOC life is rarely that easy. In large, geographically spread networks, the performance of the IP/MPLS control plane is an important factor in data delivery. But this is often a mystery to NOC teams – they do not have access to the technology and/or the tools required to monitor the performance of the IGP and BGP routing protocols, traffic engineering tunnels, or overlay services such as layer 2 and layer 3 VPNs. The service provider NOC team also does not have visibility into past routing data to analyze transitory problems that impacted customer services. This means that many trouble tickets are closed with no resolution, and often results in finger pointing. Even in those networks where the NOC team has access to IP/MPLS routing reports, they lack contextual visibility into service traffic flow data and SNMP performance metrics correlated with routing performance. It is this gap in visibility that is filled by the Packet Design Explorer Suite. The Explorer products help service provider NOC teams understand the performance of their network’s IGP and BGP routing protocols, layer and layer 3 VPNs, traffic engineering tunnels, and multicast traffic. Presented in context with SNMP and NetFlow data for path-aware monitoring, NOC teams can be proactive, troubleshoot issues faster and cater to new service requirements quickly. If you experience hard-to-diagnose service delivery issues in your network too, you may be keen to know how you can empower your NOC team to troubleshoot them faster. We explain how in our webinar “Transform the NOC Team into Troubleshooting Heroes!” in which Matt Sherrod, Vice President of Products, talks about the challenges faced by NOC teams and how the Explorer Suite helps them triage problems up to ten times faster. Check out the webinar recording to learn how to transform your NOC team into troubleshooting heroes! Access the webinar recording now! And after you have listened to the webinar, you can also download the “How Packet Design Transforms the NOC Team into Troubleshooting Heroes” e-book which lists several use cases on how network operators around the world use the Explorer Suite to empower their NOC teams. Download “How Packet Design Transforms the NOC Team into Troubleshooting Heroes” Use Cases e-book. Ready to learn more about the Explorer Suite?